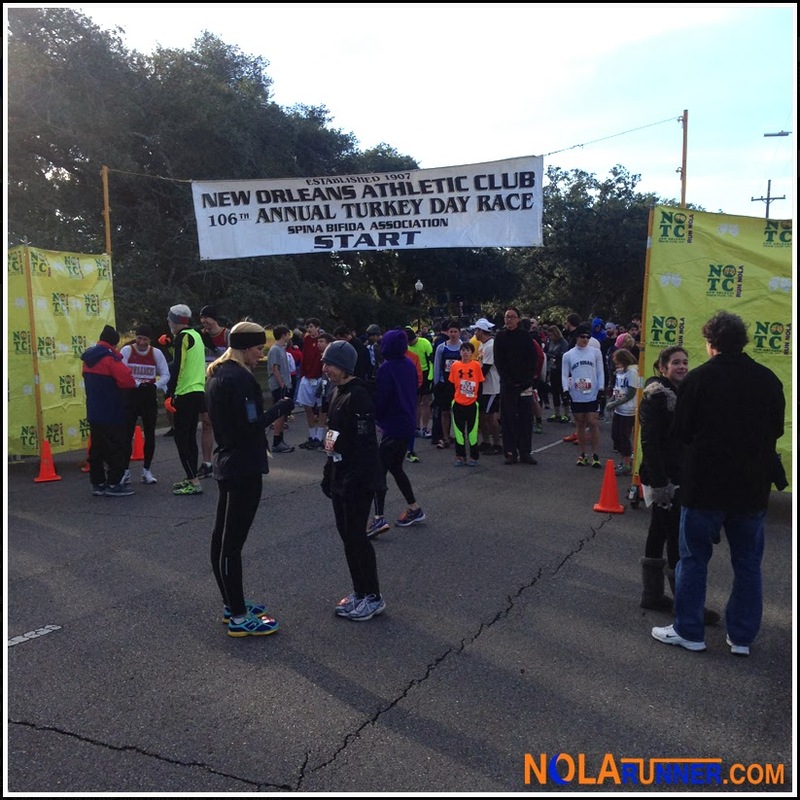 The New Orleans Athletic Club's Turkey Day Race is annually one of those events that you attend where you see people you've never seen before at any race throughout the year. Participants show up in droves, spilling out of cars in the neighborhoods of Mid City, walking to Tad Gormley Stadium, and lining up at the start line greeting family and friends as they start their holiday. This year's race, organized by The New Orleans Track Club, was again a very well attended event. Over two thousand participants lined up for a five mile trot through City Park on Thanksgiving morning, with the cool but crisp fall air doing its part to make the race really enjoyable. It's one of the most historic races in the country, with the 2013 installment being the 106th running. My coworker Kevin held me accountable to wake up in time for the 8:30am race. I was responsible for picking him up, then meeting Anne at the race site. I had picked up all of our race numbers and shirts during the super convenient pre-race packet pickup during the week prior, so parking was my only concern. To my surprise, it was easy to find convenient (and legal) parking 200 yards from the start line. We had time to spare, which meant time for us to complain about the temperature in the low 50s. Us New Orleanians are really spoiled when it comes to winter weather. Kevin and I ran the race together, which promptly started at 8:30am. It's a course that borders City Park, bisects it, and brings runners through the front of the park to take in the beauty of NOMA and the Great Lawn. Finishers enter the stadium and finish on the track next to the football field. Anne wasn't far behind us, so meeting up at the post race Elmer's Chee-Weez was quick and easy. 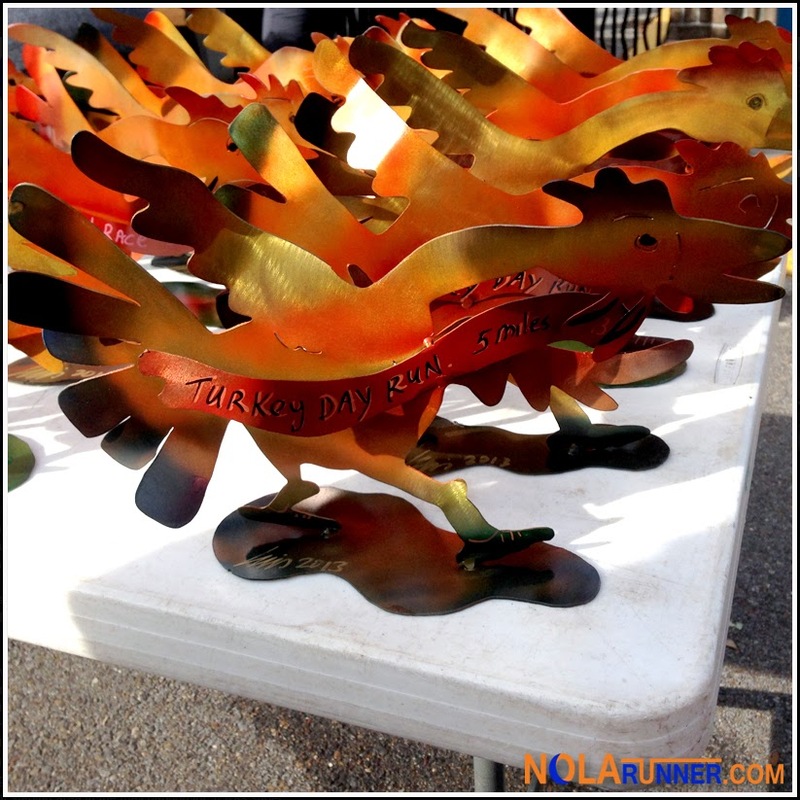 We were able to admire the really cool sculpted steel awards for race winners, meetup with a few friends, and head out to grab Starbucks before seeing our respective families for a guilt-free Thanksgiving dinner. My only complaint from the entire morning was inconsiderate runners who decided that it would be appropriate to race with double-wide strollers. Yes, I'm aware that this is a family friendly race on a holiday; however, twin strollers flying through the crowded narrow streets of City Park at an 8:30 pace is not safe for either the children in the strollers or the people around them. I can only speak for myself, but I know I was nearly mowed down at least three times by strollers passing a little too close for comfort. Race organizers did what they could to prevent this from happening, but there's only so much they can do with determined participants. Please read the race waiver you sign when you register, and know that strollers are against the rules, violate policies set out by safety officials, and are dangerous for everyone involved. The Turkey Day Race, presented by the New Orleans Track Club, is a holiday tradition that's been in my routine for years. Knowing that I'll get my morning run done before gorging on a holiday feast somehow makes the caloric intake seem negligible. I'm sure I speak for many families from the area who agree that this is a great way for them to kick off the holiday season together. Congrats to the organizers on another great race and keeping this tradition alive. I, for one, am thankful for your hard work on this race and your races throughout the year. Click HERE for final race results, and check out more photos from the morning's events on the NOLArunner Facebook page HERE! Wish I'd been in town for this race. I've only done it once (several years ago) and it was enjoyable. Kudos to the race organizers on the awards! Aren't those trophies pretty rad, Katherine? Those are for overall and age group winners. The winners of the kid's half mile race received the turkey leg trophies. Really impressed by those awards. Works of art!